Here is an oldie, but goodie! I used to make it all the time for parties….it was one of my go-to dips. But then other dips/appys took it’s place and I kinda stopped bringing it. The nice thing about this recipe is that someone, somewhere ends up bringing it to a party or get together we are at…and it resurfaces itself. Which is exactly what happened again. A friend of mine brought it to our New Year’s Eve party this year….and now it’s baaaaaack! 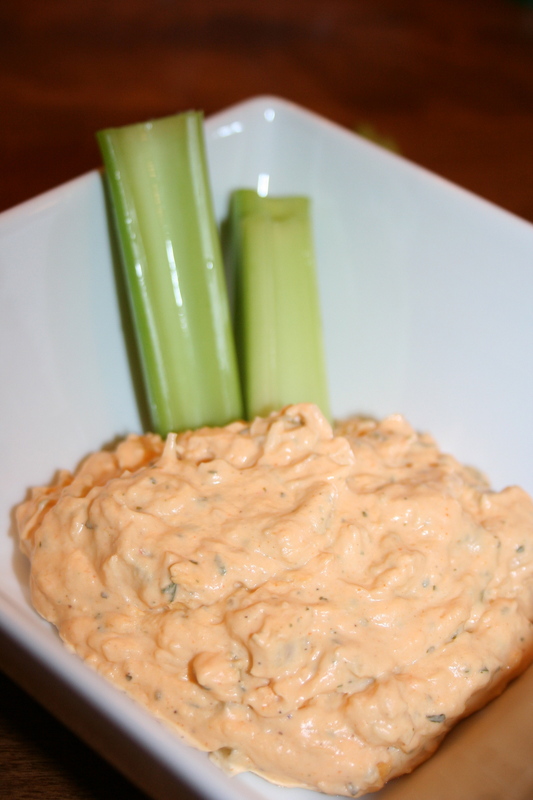 If you like buffalo-style chicken wings, you will love this dip! It’s creamy, with a little crunch and a whole lot of spice and it’s really easy! It’s a perfect dip for anytime..but especially football season! It’s also one of my husband’s favorites! Combine cream cheese, hot sauce and ranch packet in a bowl and mix well with a mixer (hand or stand) until smooth. Add chicken and celery and mix until it’s incorporated. Cook for about 20 minutes or until it starts to bubble…stirring every so often. Serve warm with celery sticks, carrot sticks, crackers or tortilla chips.